Next stage of dengue fever is dengue hemorrhagic fever. In this case, platelet count starts falling very rapidly. In this stage, patient starts bleeding. A person can be directly affected with all the stages as mentioned. Dengue fever has three serotypes (DEN-1, DEN-2, DEN-3 and DEN-4). The fatality rate of dengue hemorrhagic fever in many countries is 5%. Young adults and children experience most fatal cases of dengue fever. 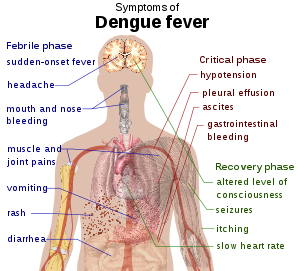 Symptoms of dengue should be controlled with proper in time dengue fever treatment.